C41909-WH is rated 4.5 out of 5 by 6. 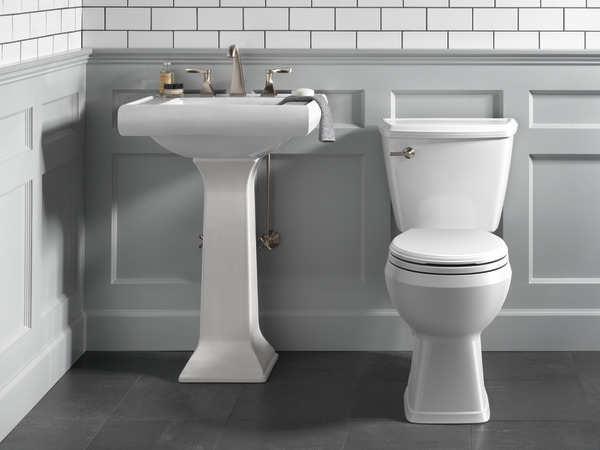 Beautifully designed for easy installation, maximum flush and water savings, this Delta® WaterSense® labeled two-piece toilet offers everything you need. 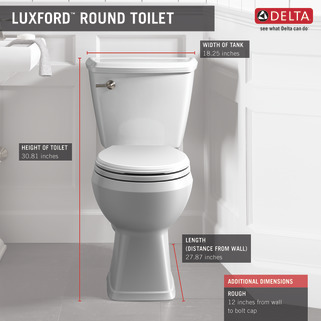 Delta toilets feature the exclusive SmartFit® tank-to-bowl connection, which reduces potential leak points and helps prevent over-tightening of the fasteners connecting the tank to the bowl, which can result in cracking in the toilet. Utilizing a metal bracket on the bottom of the tank to secure the bolts to the bowl, the SmartFit tank-to-bowl connection eliminates the need for holes typically found in the bottom of the tank. For the convenience of the installer, the three bolts on Delta toilets are preassembled to the mounting plate. Rated 2 out of 5 by George C from New Toilet I bought the toilet 11/05/2018 but us unable to have it installed until 12/18/2018. 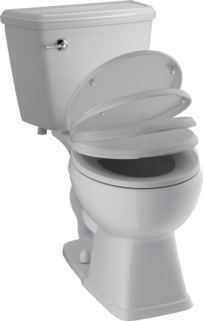 It does not flush properly - the flapper drops within 1 second of flushing and not releasing all of the tank water for a complete flush. I contacted Delta, # 07910096, and the response on 12/27/18, does not make sense relative to my problem. I will be out of town until 1/3/2019, and will be contacting Delta again for a solution to my new toilet flushing problem. I like the toilet but cannot recommend until problem resolved. 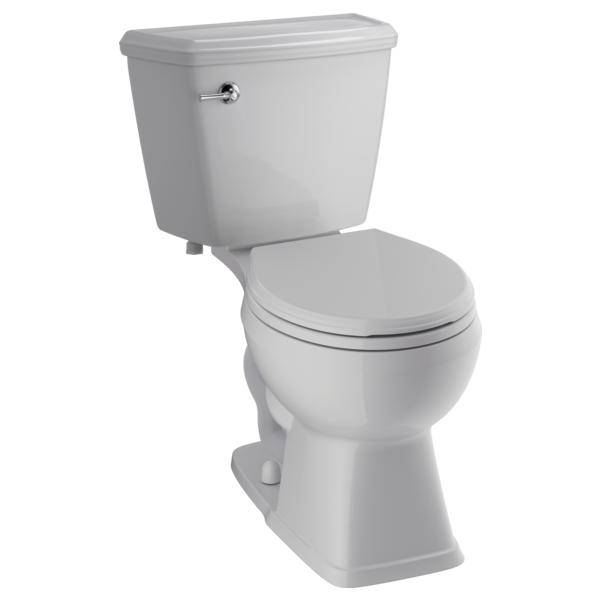 Rated 5 out of 5 by mrb49 from Easy Install Installed it three weeks ago to replace a 30 yr. old toilet in a seldom used upstairs bath room. Works great, no problems love the chair height. Rated 5 out of 5 by FixItGal from Great Design. Easy to Install I reviewed this pretty extensively on Home Depot, where I purchased it. 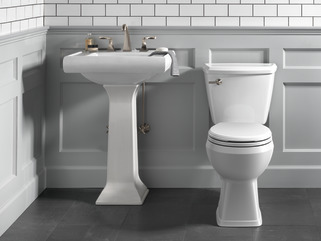 After reading about all brands of toilets in my price range, I decided on this one. I wanted chair height, round bowl, and at least an 18-inch lid width to set my decorative shelf on. This met all requirements. And, it had gotten great reviews from other buyers. It was so easy to install. If I could have lifted 85 pounds, I would have done it myself. But I'm a senior and lifting days are over. My installer was very impressed with it. No cutting of floor mounting bolts due to taller bolt caps on the base. I plan to replace another toilet with one of these next year. Please keep making the round bowl style. Elongated bowl won't fit my bathrooms. The Delta Luxford flushes well and saves water. I am very pleased. And, my knees appreciate the extra height. Rated 5 out of 5 by WETT from Very quiet and very easy to install I like everything about the Prelude. This is my second one and the toilet seat on this one is much more sturdy than the first one. The only complaint I have is trying to register it on your website. The model number was extremely difficult to find. When I did find it the website wouldn't accept it, so I selected a model number from your list. Rated 5 out of 5 by bellringer from Mass Water saver- great styling - Easy Install. Installed unit in under 1 hour including removal of old unit. you have to supply a New Wax Ring and Flange Bolts . I also installed a new water supply supple line . the unit arrived in 3 carton's there the lower bowl unit ,upper water tank (supply) and the self lowering seat. all ! needed to install the unit was a 1/2 inch and 7/16 inch open and box end wrench , utility knife , mid to large blade slotted screwdriver. putty knife for removal and cleaning of old wax ring. adjustable wrench could be used . seems to be high quality tank and bowl . . first thing I realized when testing the unit for water leaks. is how much less water this unit use compare to are old . What are the dimensions of the c41909&rsquo;s footprint?